This book brings together philosophers, social psychologists and social scientists to approach contemporary social reality from the viewpoint of solidarity. 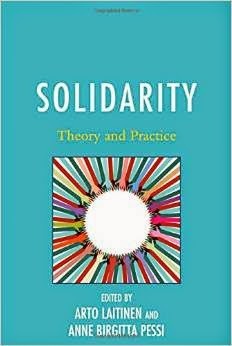 It examines the nature of different kinds of solidarity and assesses the normative and explanatory potential of the concept. Various aspects of solidarity as a special emotionally and ethically responsive relation are studied: the nature of collective emotions and mutual recognition, responsiveness to others’ suffering and needs, and the nature of moral partiality included in solidarity. The evolution of norms of solidarity is examined both via the natural evolution of the human “social brain” and via the institutional changes in legal constitutions and contemporary work life. The book is based on papers presented at an international colloquium in Helsinki in 2010. See Arto Laitinen's homepage at academia.edu, where he has uploaded many of his papers and also a copy of his book on solidarity. "Rational Reconstruction as a Method of Political Theory between Social Critique and Empirical Political Science". "Current political theory applies the concept of reconstruction almost exclusively to methods of critique. Given this focus it is often overlooked that the concept of reconstruction also has important methodological implications regarding the empirical analysis of politics. This imbalance particularly applies to how Jürgen Habermas' discouse theory of democracy has been perceived in political theory. The aim of the article is two-fold. Firstly, it offers an interpretation of discourse theory as a contribution to a "reconstructive sociology of democracy" that goes beyond the mere purpose of critique. Secondly, it seeks to illustrate the added value of Habermas' method of rational reconstruction to the empirical analysis of politics." See also Daniel Gaus's paper "Von der Kritik liberaler Demokratie zur Analyse deliberativer Systeme: Reflexionen zur gegenwärtigen Diskussionslage der Theorie deliberativer Demokratie" (2014). 1: Does the linear arrangement of the subsequent functional differentiation of the legal, the political, the economic and the educational system not draw an oversimplified (and, with regard to the legal system, somewhat misleading) picture of the thresholds, which punctuate the course of cultural and social modernization of Western societies? 2: How can we explain the dynamics of those transgressing normative ideas, which gave rise to the papal revolution, which inspired all subsequent socioevolutionary bursts, and which cultimated in creating the "Kantian mindset"? This mindset is supposed to provide a somewhat mysterious potential which inspires social evolution from the outset? 3: Does the fact that law is embedded in the context of world views mean that we have to see the pacemaker function of legal innovations as dependent on the evolution of world views? Does this mean that we need to see the evolutionary learning mechanism as located at a deeper level in society? 4: If we ascribe greater weight to the critical role of the development of world views, what is the actual importance of the ambivalent description of "post-metaphysical" thinking for a diagnosis of modern society? 5: What is the appropriate framework for a theory of social evolution, which attaches weight to the interplay between normative learning and systemic adaption?" John Rawls is widely regarded as one of the most influential philosophers of the twentieth century, and his work has permanently shaped the nature and terms of moral and political philosophy, deploying a robust and specialized vocabulary that reaches beyond philosophy to political science, economics, sociology, and law. This volume is a complete and accessible guide to Rawls' vocabulary, with over 200 alphabetical encyclopaedic entries written by the world's leading Rawls scholars. From 'basic structure' to 'burdened society', from 'Sidgwick' to 'strains of commitment', and from 'Nash point' to 'natural duties', the volume covers the entirety of Rawls' central ideas and terminology, with illuminating detail and careful cross-referencing. It will be an essential resource for students and scholars of Rawls, as well as for other readers in political philosophy, ethics, political science, sociology, international relations and law. 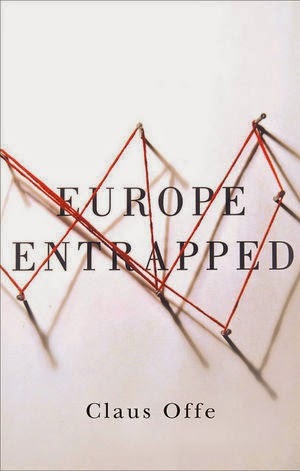 New Book by Claus Offe: "Europe Entrapped"
Today Europe finds itself in a crisis that casts a dark shadow over an entire generation. The seriousness of the crisis stems from one core political contradiction at the heart of the European project: namely, that what urgently needs to be done is also extremely unpopular and therefore virtually impossible to do democratically. What must be done - and almost everyone agrees in principle on the measures that would be needed to deal with the financial crisis - cannot be sold to the voting public of the core member states, which so far have been less affected by the crisis than those on the periphery, nor can the conditions that core members try to impose be easily sold to voters in the deficit countries. The European Union is therefore becoming increasingly disunited, with deepening divides between the German-dominated ‘core’ and the southern ‘periphery’, between the winners and the losers of the common currency, between the advocates of greater integration and the anti-Europeans, between the technocrats and the populists. Europe finds itself trapped by the deepening divisions that are opening up across the Continent, obstructing its ability to deal with a crisis that has already caused massive social suffering in the countries of the European periphery and is threatening to derail the very project of the European Union. Claus Offe is Professor of Political Sociology at the Hertie School of Governance in Berlin. The book draws upon an article published in the European Law Review vol. 19 no. 5 (2013) pp. 595-611 [Abstract]. Originally published in German in Blätter für deutsche und internationale Politik 2013 no. 1, titled "Europa in der Falle" (An English translation here). "Zum Verhältnis von Philosophie und Politik"
See also the discussion between Julian Nida-Rümelin, Rainer Forst and Jürgen Habermas on "Philosophie, Politik und die Frage der Rechtfertigung“. G. A. Cohen was one of the world's leading political theorists. He was noted, in particular, for his contributions to the literature of egalitarian justice. 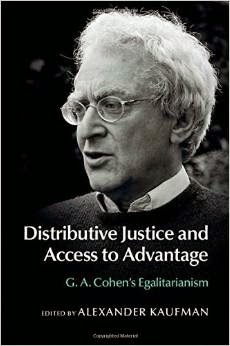 Cohen's classic writings offer one of the most influential responses to the currency of the egalitarian justice question – the question, that is, of whether egalitarians should seek to equalize welfare, resources, opportunity, or some other indicator of well-being. Underlying Cohen's argument is the intuition that the purpose of egalitarianism is to eliminate disadvantage for which it is inappropriate to hold the person responsible. His argument therefore focuses on the appropriate role of considerations regarding responsibility in egalitarian judgment. This volume comprises chapters by major scholars addressing and responding both to Cohen's account of the currency of egalitarian justice and its practical implications and to Cohen's arguments regarding the appropriate form of justificatory arguments about justice. Alexander Kaufman is Associate Professor of Political Science at the University of Georgia. He is editor of "Capabilities Equality: Basic Issues and Problems" (Routledge, 2005). - Cohen's book "On the Currency of Egalitarian Justice"
"Habermas und der Historische Materialismus"
Seit dem Ausbruch der Weltfinanzkrise 2008 ist die Kapitalismus-Kritik von Karl Marx und Friedrich Engels von neuem ins öffentliche Bewusstsein gerückt. 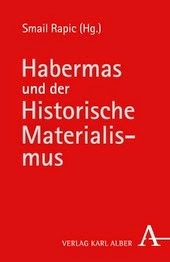 Auf einer Tagung an der Universität Wuppertal haben Vertreter verschiedener Disziplinen mit Jürgen Habermas über seine Rekonstruktion des Historischen Materialismus diskutiert. Durch die Mitwirkung von Karl-Otto Apel und Agnes Heller wurden Grundfragen der Habermas’schen Kommunikationstheorie und ihre Rolle in der Geschichte des westlichen Marxismus in die Diskussion einbezogen. Was den Band von sonstigen Tagungsbänden abhebt, sind die Entgegnungen von Jürgen Habermas sowie repräsentative Ausschnitte aus der öffentlichen Diskussion.